As the holiday season is quickly approaching, it’s time to plan for holiday parties, including your office holiday party. This year, it doesn’t have to be the same old event everyone is expecting. 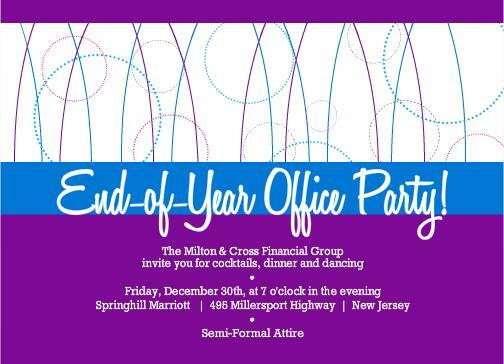 It doesn’t take much to turn a traditional office holiday party into a fabulous bash! We’ve put together some office holiday party ideas to help you create a sensational celebration. Send out your office holiday party invitations early, particularly if your office party will be at a location other than the office or if it will fall on a weekend. The earlier you can get it on people’s calendars the better. 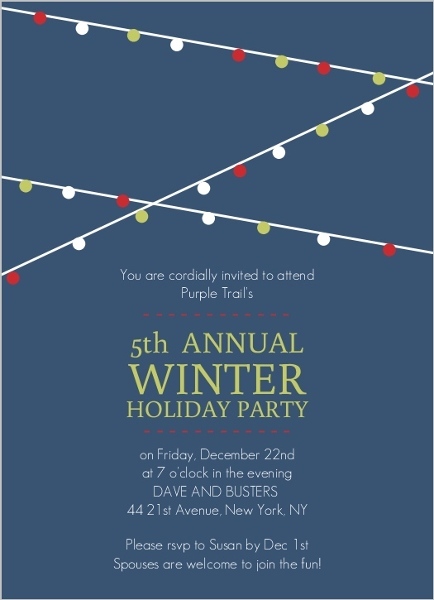 PurpleTrail has a sensational collection of holiday party invitations for business holiday parties and corporate events. All of our holiday party invitations can be easily personalized to suit your needs. Plan a theme for your office holiday party. A themed party is a fun way for colleagues to relax and enjoy themselves. Here are a few holiday party theme ideas. There are many cultures represented in our workplace. Invite colleagues to bring their favorite cultural dishes to the party to share. Hanukkah, Kwanzaa, Diwali and Eid are all celebrated in the fall and winter seasons. Incorporate decorations from a variety of holidays. It’s a great way to learn more about your colleagues and their traditions. Who doesn’t love the leg lamp? There are many party supplies available for A Christmas Story party so that you can create the classic ambiance that gives this movie so much charm. Just don’t leave the turkey alone with the dog! So it’s not a classic Christmas or holiday theme, but it’s a lot of fun. Choose a specific time period like the 1920’s or Hollywood in the 40’s and ask guests to dress up in costume. A murder mystery party is a fun way to have a little escape from the reality of the daily grind. A holiday sweater party is the best excuse to bring out those old holiday sweaters in the back of your closet. It’s good for a laugh and the sweaters serve as an icebreaker and conversation piece. Play trivia. If you’re a close group, you can play trivia using facts about each other. You can also play Christmas trivia, movie trivia or use general trivia facts. Divide the group into teams and compete for a prize. Two truths and a lie. Have each party guest state two things that are true as well as one lie. The party-goers must guess which statement is a lie. The results are usually very surprising! Secret Santa Gifts. Set a spending limit, draw names out of a hat, and do a gift exchange at your office holiday party. A white elephant gift exchange is always a fun experience as well. Photo booth. Everyone loves a photo booth! Consider investing in a photo booth rental or read up on how to create your own DIY photo booth. Employee awards. Whether they’re funny or simply full of praises, handing out employee awards at the office holiday party is a great way to boost morale. Create a custom framed print to display the award with PurpleTrail’s easy online design center. Casino games. From blackjack to poker, casino games are a fun way to keep everyone entertained. There’s no need to deck the halls with red and green. Black and white or blue and silver make beautiful color schemes for holiday parties. Consider a winter wonderland theme with white snowflakes, silver tinsel and white tablecloths. If you’re having the party at the office, remember that less is more. Someone will be stuck cleaning everything up, and everyone will want to go home and enjoy the holiday break with their families. An elegant tablecloth, a stunning centerpiece and some paper snowflakes will go a long way. Christmas ornaments are for more than just Christmas trees! Shiny, bright, easy to use and cheap to buy, they make great office holiday party decorations. Stick some colored ornaments in a glass bowl for a lovely centerpiece. We hope these tips have helped you plan your best office holiday party yet. Cheers!